Robert Kirkman and Jay Bonansinga's thrilling New York Times bestsellers -Rise of the Governor and The Road to Woodbury- are combined to reveal the origin of the most ruthless villain in The Walking Dead Universe! In the Walking Dead universe, there is no greater villain than The Governor. The despot who runs the walled-off town of Woodbury, he has his own sick sense of justice: whether it's forcing prisoners to battle in a zombie-infested arena for the townspeople's amusement or chopping off the appendages of those who cross him. But where did he come from? For the first time, fans of The Walking Dead will discover how The Governor became the man he is, and what drove him to such extremes. While the zombie plague unleashes its horrors on the suburbs of Atlanta without warning, pitting the living against the dead, Lilly Caul struggles to survive in a series of ragtag encampments and improvised shelters. But the Walkers are multiplying. Dogged by their feral hunger for flesh and crippled by fear, Lilly relies on the protection of good Samaritans by seeking refuge in a walled-in town once known as Woodbury, Georgia. At first, Woodbury seems like a perfect sanctuary. Squatters barter services for food, people have roofs over their heads, and the barricade expands, growing stronger every day. Best of all, a mysterious self-proclaimed leader called The Governor keeps the citizens in line. But Lilly begins to suspect that all is not as it seems. . . . The Governor has disturbing ideas about law and order. "An entertaining read." --ComicBookMovie.com, on "The Walking Dead: The Road to Woodbury"
"The novel fleshes out . . . backstories and connects them, giving depth to people who remained largely mysteries in the comic books. For comic book readers, the novel is full of easter eggs and surprise connections, making it not only entertaining, but necessarily for filling in the gaps left by the comic books . . . 'The Road to Woodbury' is an essential read for any fan of 'The Walking Dead'." --Examiner.com, on "The Walking Dead: The Road to Woodbury"
"Zombie-apocalypse stories are perfect for miserable winter weather regardless, but for those obsessed with "The Walking Dead "(such as yours truly), this is essential reading. This is the epitome of a page-turner, and makes subway rides just breeze by. And, that end -woof." --REFINERY29, on "The Walking Dead: Rise of the Governor"
"An excellent companion to the "The Walking Dead" comic books. The story is enriched by the novel format, and the characterization of the series' most hated villain is something no fan will want to miss." --"Examiner.com," on "The Walking Dead: Rise of the Governor"
"This book stands alone and is a compelling read for fans of the series or just fans of zombies. Watch out though, because once you get a taste of the particular Kirkman brand of zombie mayhem, catching up on past issues is just around the corner." --"The Ossuary," on "The Walking Dead: Rise of the Governor"
"The story makes a great novel. You'll get sucked in and can easily visualize everything that is happening. It's simply a great read." --"Comicvine.com," on "The Walking Dead: Rise of the Governor"
"It takes great advantage of the literary medium in a way that most tie-in books would not." --"TVOverMind.com," on "The Walking Dead: Rise of the Governor"
"Not for the faint of heart, this book runs on pressure-cooker suspense, graphically described bloodshed, and dark acts of brutality...This riveting character study adds a new dimension to the oeuvre by fleshing out established characters and plot lines." 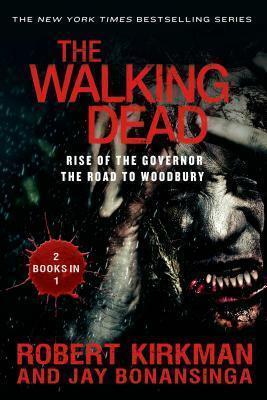 --"School Library Journal," on "The Walking Dead: Rise of the Governor"
JAY BONANSINGA is a New York Times bestselling novelist whose works include Perfect Victim, Shattered, Twisted, and Frozen. His debut novel, The Black Mariah, was a finalist for a Bram Stoker Award.